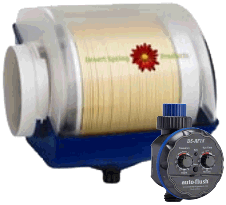 the ultimate humidification system for hard water installations! The Desert Spring whole house furnace humidifier is the only humidifier that uses patented rotary disc technology to prevent mineral build-up and to inhibit bacteria and mold growth. 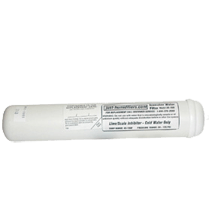 The AutoFlush is a self-cleaning device designed specifically for the Desert Spring furnace humidifier. The Desert Spring Humidifier AutoFlush System removes minerals from the humidifier by flushing the reservoir at user defined intervals between once per hour and once per week. 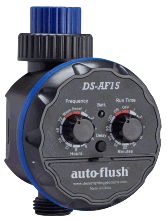 The Auto Flush valve remains open for a user defined duration between one minute and two hours, sweeping away unwanted mineral deposits and eliminating the possibility of stagnant water accumulation which could create an environment for mold or bacteria growth. The in-line anti-scale humidifier filter employs the scale inhibiting properties of polyphosphate to eliminate more than 95% of scale-forming inorganic minerals such as calcium. 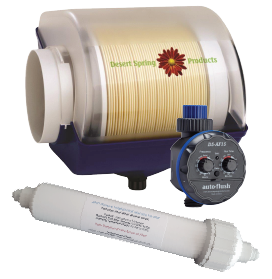 When added together these three products comprise the ultimate hard water humidification system. Purchasing the AutoFlush and anti-scale filter with your Desert Spring humidifier as part of our "Ultimate Value Package" saves you money and provides the peace of mind of knowing that you have purchased the ultimate humidification system for hard water applications. All of our Desert Spring D3200 humidifier packages come complete with humidistat and all required fittings for installation.